OAKLAND — A former follower of Your Black Muslim Baker leader Yusuf Bey IV who once faced contempt of court charges for refusing to testify against Bey IV said in court Thursday that he no longer “gives a damn” about the fallen institution and its jailed leader. Kahlil Raheem told jurors that he was given immunity from charges to testify against another bakery follower, Richard Lewis, who is being tried on 13 felony charges in the alleged May 2007 kidnapping of two women and the torturing of one of them. Raheem testified that Bey IV called him the night of the crime and ordered him to come get him in East Oakland. A police officer had previously testified that he rescued the two women and that the defendants fled. Prosecutor Christopher Lamiero contends that Bey IV, on the run from police, phoned Raheem to help him escape capture. Raheem testified that he drove to East Oakland and picked up Bey IV and another defendant, Tamon Halfin, then tried to retrieve a car used in the kidnapping. But police had swarmed the crime scene; Raheem said he feared detection if he tried to drive the car away. When he went back the next morning, police had towed the vehicle from the scene. At Bey IV’s order, he reported the car stolen and lied to police, he testified. He said he later agreed to cooperate when detectives confronted him with cell phone records that showed he had been lying about his whereabouts. “They showed you phone records that showed where you were when calls came through and when presented with information you realized you couldn’t lie anymore?” Lamiero said. Raheem did not testify directly that Lewis was involved in the alleged kidnapping, or that he saw Lewis that night. He said he knew Lewis only by the nickname “Kai” and described him as “just another brother” who came to the bakery for employment. Lamiero contends that Bey IV recruited Lewis when they were briefly jailed together in 2006 to join his organization because Lewis was willing to use violence to do whatever Bey IV ordered. The kidnapping, Lamiero has told jurors, was a failed, desperate attempt by Bey IV to steal money from drug dealers to pay off the bakery’s mounting debts. When Bey IV, Lewis, Halfin and another defendant who has now pleaded guilty, Yusuf Bey V, went through a preliminary hearing in 2007 and 2008, Raheem at first refused to testify and was nearly jailed on contempt charges. In recorded jail phone calls, Bey IV repeatedly urged Raheem not to testify, even if it mean being jailed. During nearly three days of testimony in Lewis trial, Raheem insisted he is now telling the truth. He was given immunity from possible charges as an accessory after the fact in the kidnapping case and a promise of probation rather than jail time in a case involving vandalism of two Oakland liquor stores, to testify against Lewis. Raheem said he “guessed” those allegations were true. He said the more he learned about Bey IV’s various alleged crimes, the more distant he became from him. 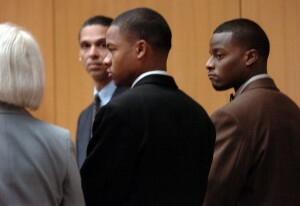 Bey IV is charged with ordering Bailey and two other men killed in the summer of 2007 and is scheduled for trial in May. Raheem said when he testified at the preliminary hearing he was worried because members of the Bey family were in the audience and he was worried “about how I was being viewed.” He said he does worry about the perception that cooperating with prosecutors creates. “I still live in the city of Oakland. There are a lot of morons and idiots out there,” he said.